Often, Financial Advisers use the phrase ‘time in the market’, not ‘timing the market’. Although this is a well-used phrase, I would like to explore what this means and the impact it may have on your portfolio. The primary emotions that drive investment decisions are ‘greed’ and ‘fear’. When markets are experiencing strong growth, investors tend to want to invest more capital and retain investments that have outperformed, as greed takes over their investment decisions. Conversely, in declining markets, fear creeps in as values decline, and it becomes harder for investors to see the light at the end of the tunnel. If we allow these emotions to drive our investment decisions, we would typically be investing when markets are growing or peaked, and selling when markets are declining or bottomed. This is contrary to the fundamental investment philosophy ‘buy low’ and ‘sell high’. During 2016, there were two key events which caused increased volatility in financial markets – Britain’s referendum to leave the European Union (Brexit) in June, and the United States election in November. In the two weeks leading up to Brexit we saw financial markets decline, with a significant fall of -3.68% on the day the referendum passed. However, once the financial markets processed the information, we saw a 5.65% recovery during the following two weeks. A very similar scenario arose in the two weeks leading up to the United States election, where we saw financial markets decline again, with a significant fall on the day of the election resulting in a negative return of -5.29%. After Mr. Trump was elected and the financial markets processed the result, we saw markets recover by 5.32% during the following two weeks. If you sold your Australian Equity investments two weeks before both the Brexit and the US election, then waited two weeks for the market to stabilise before reinvesting, the return for the 2016 calendar year would have been 5.79%. It is human nature to feel ‘fear’ in the lead-up to events such as Brexit and the US Election and consider exiting your exposure to growth investments, and to re-invest once the markets have ‘stabilised’. However, timing your re-entry becomes very difficult. The Australian All Ordinaries Index return was 7.80% during the 2016 calendar year. 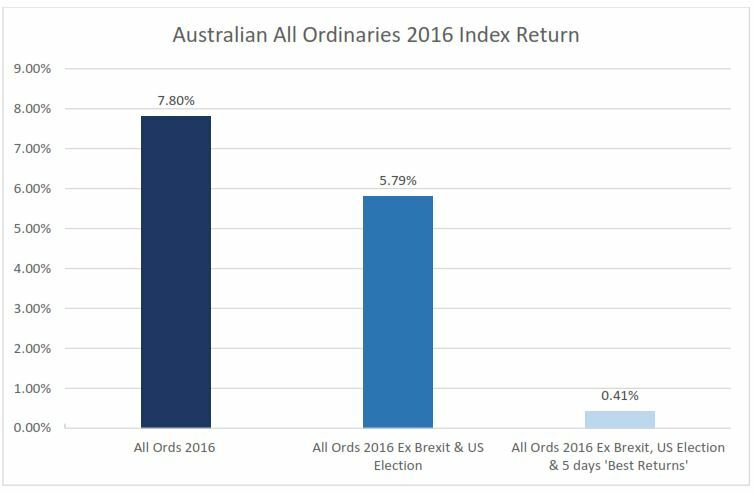 Excluding the two weeks before and after Brexit and the US Election, the Australian All Ordinaries Index return would be 5.79% during 2016. Waiting for markets to ‘stabilise’ and missing the best five individual trading days after Brexit and the US Election, the Australian All Ordinaries Index return would be 0.41% during 2016. Therefore, your margin for error when re-entering the market is very small. If you miss the best days on the market, this will have a detrimental impact on your investment return. As demonstrated above, it is clear that remaining invested from January 1 – December 31, 2016 would have provided you with better returns than exiting and re-entering the market during and after Brexit and the US election. Over your investment timeframe, there will be periods of both growth and decline, however, dividend income remains relatively steady and should grow as the companies you hold grow. If you periodically rebalance your portfolio in line with your benchmarks, you effectively compound your investment returns simply by holding quality investments for the long term. Maintaining a well-developed financial plan in 2017 remains critical, as financial markets will undoubtedly experience continued volatility in the face of further global challenges. During volatile times, the role of a Financial Adviser is to provide appropriate advice and structure your portfolio to ensure you never become a forced seller of growth assets, which enables your portfolio to have the best opportunity to grow over time.